The M1-D Marine Infrared Camera combines visual imaging, thermal imaging and laser targeting to create a breakthrough in size, performance and features for a Marine PTZ camera system. CALL TODAY for pricing! (702) 369-3966. 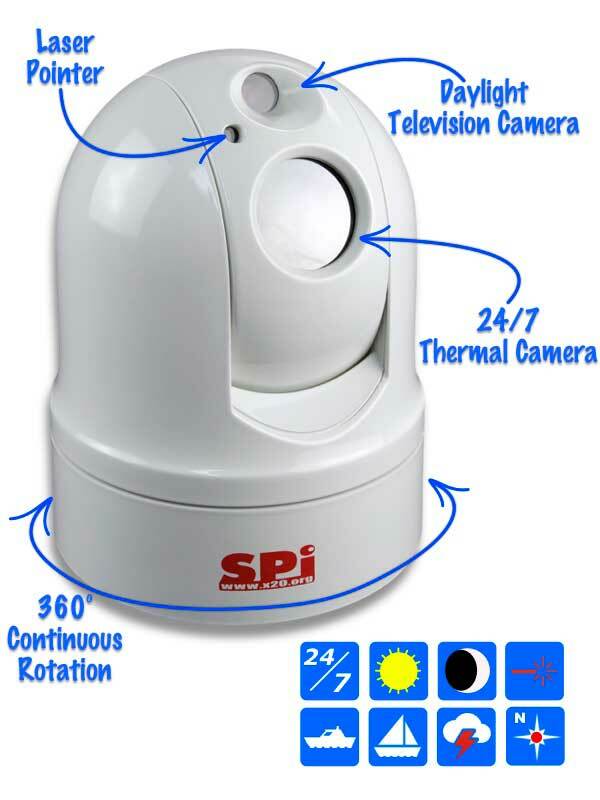 The M1-D Marine Infrared FLIR Thermal Camera is the latest multi sensor pan tilt camera system from SPI CORP. 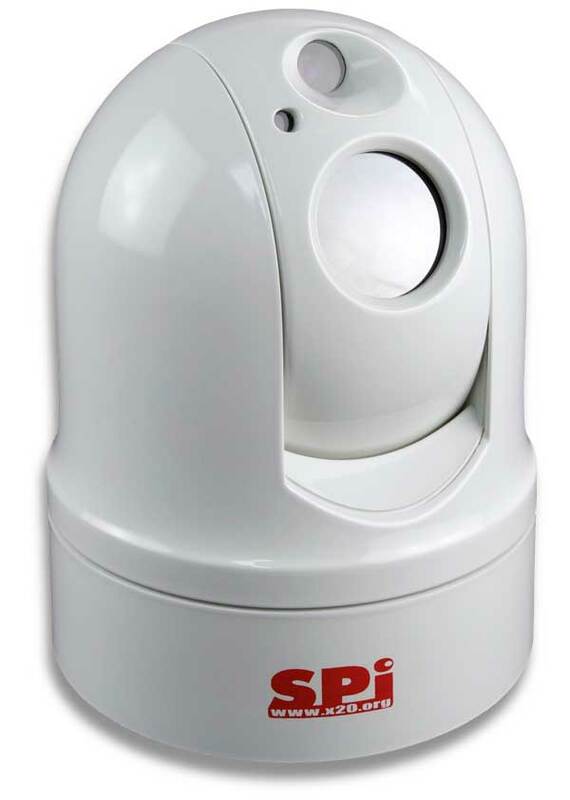 The M1-Dis the first affordable micro PTZ camera designed for use on any vessel as a marine ptz camera system. The unit features an integrated thermal camera (FLIR), CCTV visual imaging camera and laser pointer in an ultra compact rugged marine housing. The M1-D is a marine PTZ remote positioning THERMAL IMAGING COMBO CCTV CMOS system suitable for mounting on a wide range of vessels in ocean and fresh water environments. The M1-D is the breakthrough product that you have been waiting for to satisfy your imaging needs 24/7/365 at a price you will not believe. The M1D Marine PTZ Thermal Imaging FLIR IR camera with CCTV low light camera can be custom configured to your specific application. 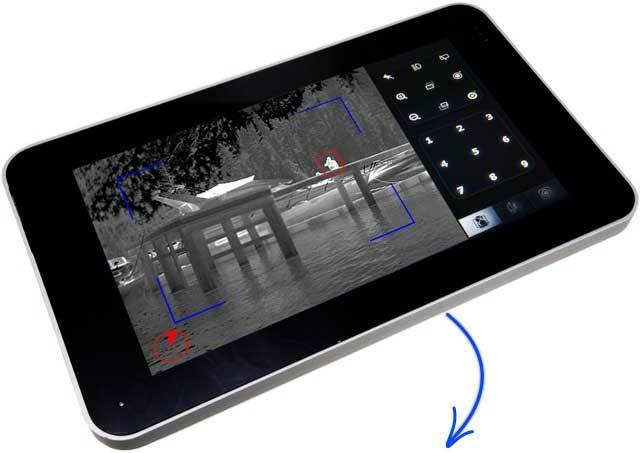 The M1-D marine infrared camera is loaded with features. In fact no other system on the market combines all these features into a compact, lightweight housing. In order to get a system with all these features you would have to pay many times the cost of the M1-D marine infrared camera PTZ. The M1-D is the most affordable marine thermal ptz camera on the market today. Every M1-D PTZ MARINE THERMAL FLIR IMAGER includes a high resolution thermal camera with zoom, a crystal clear visual CCTV daytime video camera and a bore sighted laser pointer for indicating objects in your field of view. The marine ptz base on the M1-D also features continuous 360 degree pan rotation and +- 90 degree tilt so you never miss the action. The system can be mounted right side up or inverted which greatly expands the mounting possibilities on today’s complicated vessels. When you find out how affordable the M1-D marine ptz thermal camera is you will not believe it. The new M1-D Tablet PTZ control interface is here. Touch screen control of your M1-D thermal PTZ system! The FLIR thermal sensor in the M1-D marine infrared camera gives you clear vision in total darkness. The ability to see in the dark makes the M1-D an ideal aid to navigation and compliments your existing radar to give you 360 degree visibility. Radar is a wonderful tool that is now commonplace on vessels of every size. The M1-D will not replace your radar set but rather acts in conjunction with it to give you maximum information about your surroundings. While radar will spot potential targets and terrain, the M1-D will actually give you a detailed video image of what may be lurking up ahead. The high seas can be a harrowing place to travel. This infrared PTZ camera is so versatile it works in any conditions, making it perfect for border patrol, homeland security & detecting possible pirate ships from many kilometers away. Detect the dangers of sea travel and adjust course long before the bad guys get to you, so you make it to your destination safely with your cargo intact. This infrared camera can also protect you from colliding with unseen icebergs in the dark. Because they use thermal imaging, you’ll clearly spot the frozen danger long before you reach “Titanic” status. A FLIR Marine infrared camera sensor is so valuable to locating and rescuing stranded boaters in a man overboard situation that it should be required equipment on all vessels, large and small. The FLIR thermal sensor produces a crystal clear video image day or night regardless of lighting or weather conditions. Due to the physics of thermal imaging sensors water produces a very even “dark” background making it easy to spot objects on top of the water. A human floating in the water will stick out like a sore thumb! This can greatly reduce the time needed to spot a victim overboard, especially in the dark of night. To further aid in rescue the M1-D has a visible laser pointer so that you can pinpoint the location of the victim while circling around to retrieve them. There is no doubt about it, the M1-D Marine PTZ has the potential to save lives! Ah the joys of docking your boat. The approach to the harbor and the process of docking a vessel in a slip or crowded anchorage can be a stressful task regardless of your skill level or boat size. The difficulty is compounded when trying these maneuvers at night or in inclement weather. Spotlights can help but by definition you can only see the “spot” that the “light” is pointed towards. With an M1-D FLIR PTZ you get a crisp full color thermal video image of the entire scene around you. Clearly see the dock, buoys, boat traffic and moorings regardless of darkness or weather. The fear of darkness and the desire to see at night are human traits deeply ingrained in our DNA. The experience of seeing in the dark literally “opens your eyes” and takes your breath away. The M1-D FLIR PTZ gives you more docking functionality than other FLIR PTZ systems on the market. With the integrated LASER designator (an M1-D exclusive) you can easily point out what you are seeing to the rest of your crew. Now instead of just barking verbal commands in the dark regarding hazards ahead you can also give them a visual cue by firing the laser. The combination of visual and auditory commands greatly increases crew comprehension which minimizes stress leading to faster and safer boat handling. Standing a mere 6″ Tall…. With a Diameter of 4.5″…. THIS LITTLE GUY WILL KNOCK YOU OUT! Don’t let the micro size of the M1D PTZ FLIR Marine infrared camera fool you, this is a serious multi sensor imaging system designed for the harsh conditions of marine operations in the field. With the latest in thermal, visual and laser technologies the M1-D PTZ THERMAL CAMERA offers more to the user than systems three times the size and three times the cost. The M1-D marine Thermal imager can also be inverted making it the perfect option for mounting on mast and bridge supports. The M1-D Marine IR camera, this little guy packs a big punch! Test footage of the M1-D Marine camera on Lake Mohave in Arizona. It was 120 degrees so this is truly demanding conditions for a thermal camera. The M1-D is awesome. The M1-D marine infrared camera utilizes industry standard control protocols to easily integrate with the widest variety of COTS (Commercial Off The Shelf) PTZ keyboard controllers. We have a number of joystick control keyboards that work excellent with the M1-D FLIR PTZ camera system. Most of our controllers feature integrated LCD screens for easy installation. We even have a tablet controller that operates the PTZ system and displays the video. Call us with your application and we will help you determine the most appropriate camera control option.